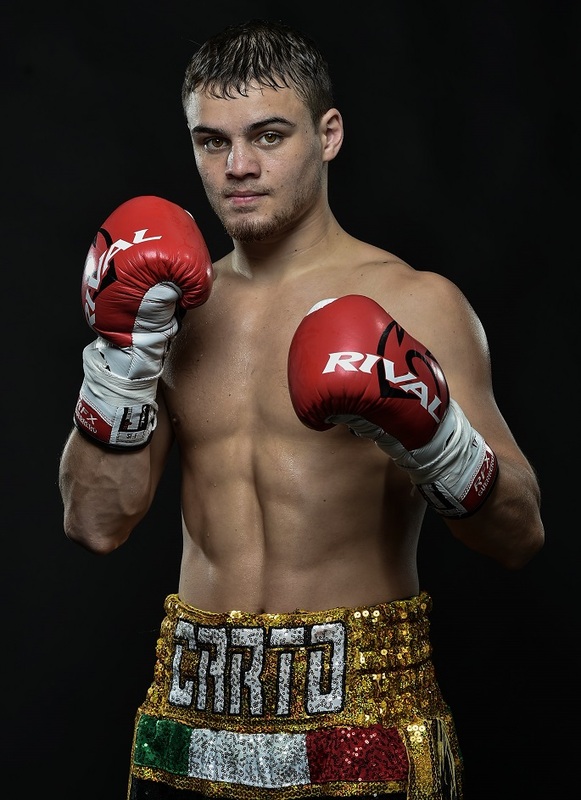 Philadelphia has long prided itself on its rich pugilistic tradition, and while the current boxing scene may not be as vibrant as in the glorious past, bantamweight prospect Christian Carto is staking his claim as one who will help make boxing hot again in Philly. The 21-year-old is not wasting any time and since turning pro in July 2016 has notched 15 straight wins. This Saturday he returns to action against experienced Mexican battler Javier Gallo on the big Top Rank card at the Ocean Resort Casino in Atlantic City. It’s been a while since anyone could say this, but in my opinion The City of Brotherly Love, which provided the backdrop to Sylvester Stallone’s Rocky films, may have found its new and very real “Rocky” hero because not since the mid-80’s, when many thought decorated amateur Vinny Burgese fit that bill, has there been an Italian-American boxer inspiring this level of interest and popularity. Burgese, it will be remembered, ran into another Vinny, Rhode Island’s Vinny Pazienza, who floored him four times before putting an end to Burgese’s “Rocky” dreams. Anything can happen in boxing, but right now, such an outcome looks unlikely for young Carto. In March Carto defeated James Smith by decision. And while you won’t find Christian Carto running up the Philadelphia Museum of Art steps, or pounding raw flesh in a meat packing plant, or running through the market section of the city’s Italian district, make no mistake: he is Philadelphia through-and-through. In fact, he traces his heritage to a fighting family deeply rooted in South Philly. Joe Carto came first in 1932, and Frankie Carto followed, and between 1941 and ’46 he battled champions Phil Terranova, Chalky Wright and contenders Billy Graham and Lulu Constantino. Nunzio, the youngest of the Carto fighting clan, came next and after two years in the pros retired. And for a time in the mid-1950s Frankie Carto also managed Joey Giardello, who later became world middleweight champion. Philly fight fans recognize talent when they see it and Carto is already attracting serious attention in his home city. He boasts a solid amateur pedigree, having captured the United States National Golden Gloves light-flyweight title in 2014, a belt annexed by the likes of Johnny Tapia, Michael Carbajal and Floyd Mayweather Jr. Carto has twice topped cards at the SugarHouse Casino and the Arena, as well as playing chief support to more established pugilists Ray Robinson, Tevin Farmer and Joey Dawejko. 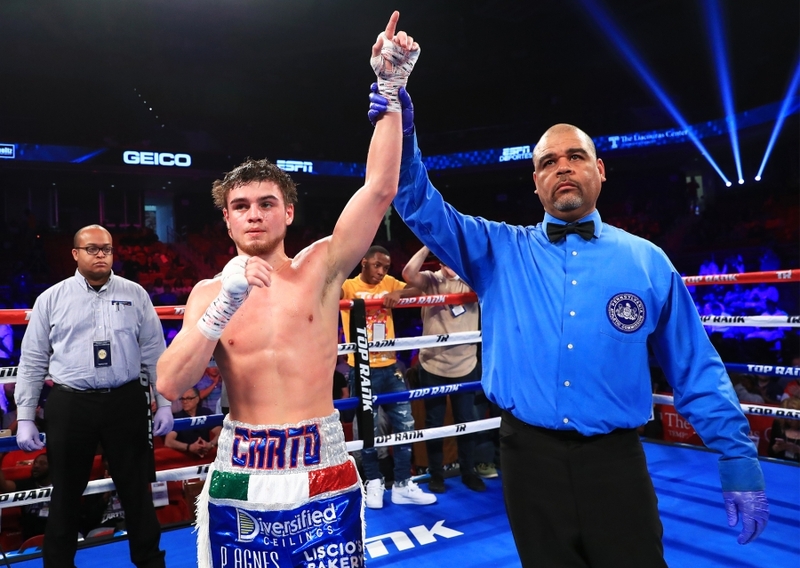 Christian Carto: 15-0 with 11 KO’s. Carto began boxing at eight-years-old when he followed his older brother to the gym. Twice weekly workouts became thrice weekly sessions and right through to 2012 he combined it with his love for ice hockey. 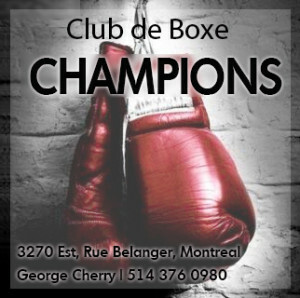 But following a bronze medal at the junior Golden Gloves he made the decision to focus strictly on boxing. Six years later Carto stands on the cusp of big things in a stacked division as he sets his sights on becoming the first Philly fighter to capture a world bantamweight title since “Joltin” Jeff Chandler 35 years ago. The hard-hitting boxer-puncher fights with an uncomplicated, no-nonsense fluidity and his performances are full of energy and determination. His shows are sold-out long before fight time and local sponsors are eager to emblazon their logos on Carto’s outfits. The young prospect has refused to sign up with any of the big promoters, believing that the best way forward is to go it alone and benefit from single fight sponsorship packages and his share of ticket sales. 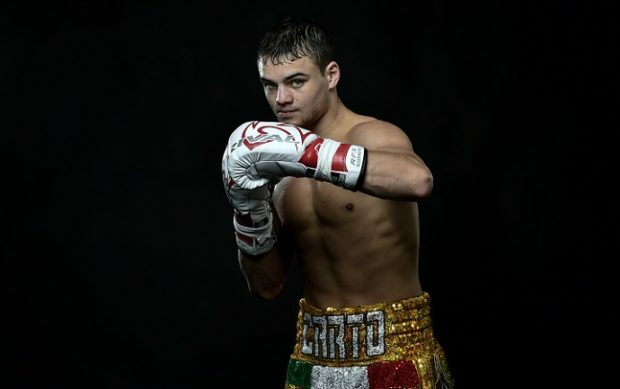 Carto started his pro career in explosive style recording eleven consecutive knockouts, but as the level of competition has toughened Carto has been forced to go the distance in his last four contests. It’s not a point that unduly concerns the ambitious Philly fighter. 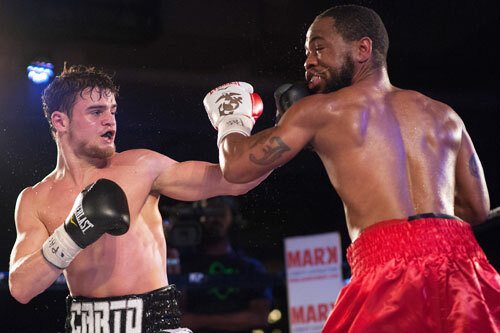 In his last outing back in April on the Magdaleno vs Dogboe card, Carto got a taste of how rough things can get in the pro ranks. Comfortably ahead on all scorecards, and having staggered the respected Edwin Rodriguez in round five, a heavy headbutt in the sixth briefly shifted the momentum in favour of the Puerto Rican. With one eye firmly fixed on the future, Carto believes that the rigours of hard training six days a week will eventually pay off. 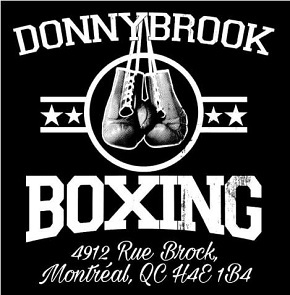 Of late Christian has been focusing on his elusiveness, speed and foot movement by working with heavier opponents like promising Philly boxers Manny Folly and Stephen Fulton, the latter being Carl Frampton’s sparring partner. 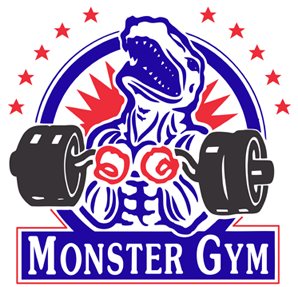 Since their last outing, Team Carto has also made a notable change in removing long-time trainer Mickey Rosati, who guided the young gun from the amateurs, and replacing him with new head coach Billy Briscoe, who trains two-time world title challenger Gabe Rosado. 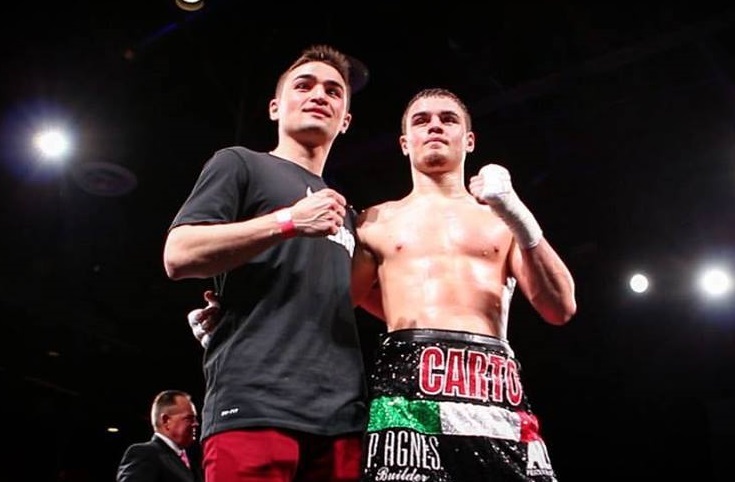 Indeed, manager Frankie Carto is working hard, using his sports management and marketing degree to help build up the Carto brand for his younger sibling. Frankie and Christian: brothers and partners. 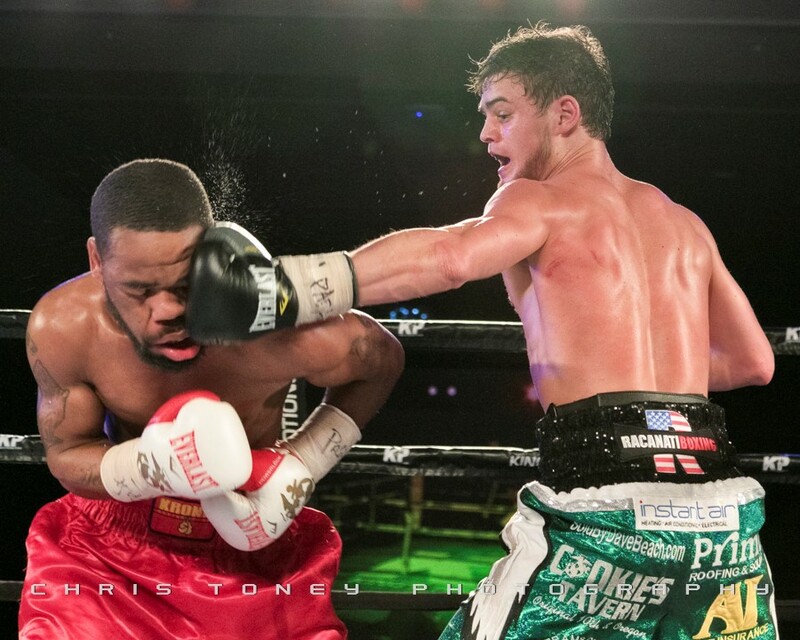 Sounds like a winning formula for Christian Carto and for boxing in Philadelphia.